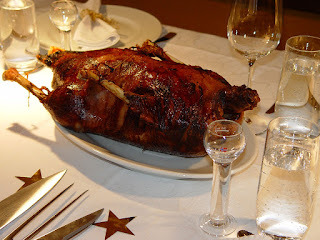 The Wrong Sword: Medieval Recipe Day - Christmas Goose! Medieval Recipe Day - Christmas Goose! Mix the herbs and fruit and use to stuff the goose. Sew the body cavity closed then place the goose in a roasting dish and place in an oven pre-heated to 200°C. Roast for an hour and a half until done (the flesh should be slightly pink in the middle). Cook for longer if you want it well done. To make the sauce, take the dripping from the goose and add white wine and the spices. Place in a saucepan and bring to the boil. Reduced until thickened then carve the goose and drizzle the sauce over it. Unfamiliar ingredients: quince and galingale. The quince fruit is related to the pear and the apple; its flavor is sweet, somewhat tart, and the flesh is dry, and not grainy. It's usually cooked instead of being eaten raw. Galingale is related to ginger; like ginger, the root is used in cooking and herbal medicine. Its taste and smell are different from, and stronger than, those of ginger. And please notice that the recipe is mostly in metric, not imperial, units. Available at a Library Near You!